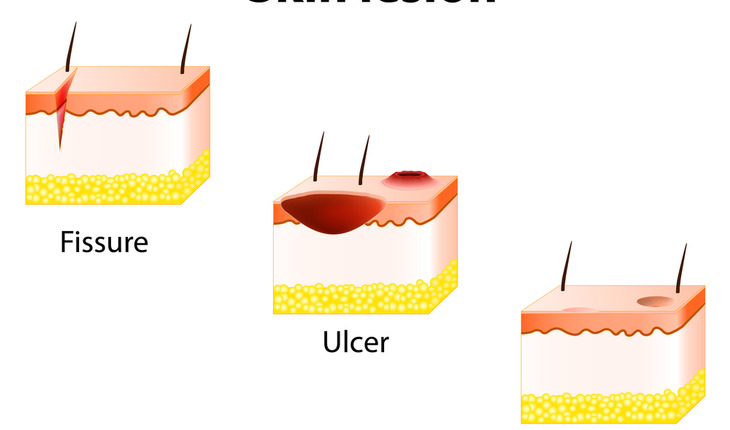 What Can Accelerate the Healing of Diabetic Ulcers & Other Skin Injuries? A Massachusetts General Hospital (MGH) research team has found a surprising potential solution to a persistent clinical problem – the healing of chronic wounds. In their report published in Wound Repair and Regeneration in October 2017, the investigators from the MGH Vaccine and Immunotherapy Center (VIC) describe how application of mature B lymphocytes – the immune cells best known for producing antibodies – greatly accelerated the healing of acute and chronic wounds in both diabetic and nondiabetic mice. The treatment also improved the quality of regenerated tissue and reduced scarring. Patients with diabetes are at risk of developing chronic wounds, particularly foot ulcers, because of two complications of the illness. Neuropathy damages the nerves in the skin, particularly the hands and feet, causing a loss of sensation that can lead to repeat injuries of the same structures. Vascular disease limits blood flow to the skin and adjacent tissues, cutting off the supply of oxygen and nutrients required for healthy tissue healing. Between 19 and 34 percent of patients with diabetes develop chronic foot ulcers, the presence of which significantly increases their risk of death compared with patients without foot ulcers. Healthy wound healing has four phases: blood clotting to stop bleeding, inflammation to remove dead and damaged cells, proliferation of new tissue and the remodeling of tissues to be stronger and better organized. It is believed that chronic wounds get stuck in an inflammatory phase, with a low-oxygen microenvironment and the persistent presence of enzymes that break down tissue proteins. Recent studies from the VIC and other centers have identified several unsuspected roles for B lymphocytes, including the secretion of powerful anti-inflammatory molecules. A previous study from members of the MGH team, in collaboration with scientists at the St Joseph’s Translational Research Institute, found that injecting B cells into cardiac tissue damaged by a heart attack improved structural and functional recovery in an animal model. For the current study the team first isolated mature B cells from the spleens of diabetic and nondiabetic mice. Their series of experiments showed that a single application of concentrated, mature B cells accelerated wound healing and improved the quality of tissue repair in both animal models. B cell treatment also quickly reduced the size and improved the healing of chronic skin ulcers in the diabetic mice, increasing the number of both nerve endings and blood vessels in regenerated tissue. Remarkably, the same healing effect was produced when B cells from older obese diabetic mice were applied to acute wounds in similarly aged, obese diabetic mice. Both groups of animals were equivalent to 55- to 60-year-old morbidly obese patients with uncontrolled diabetes, the most difficult population to treat. The sort of mature B cells used in this study have a limited life span, and once applied on a wound, they remained active at the site for up to 14 days. This makes them easier to control than other types of cells used in therapies and makes side effects unlikely. Overall, the presence of B lymphocytes was associated with increased tissue proliferation, reduced cell death and a more supportive environment for wound healing. Sîrbulescu notes that it is possible to isolate high numbers of a patient’s B cells through a standard blood pheresis procedure, allowing collection of enough cells for several treatments at a single session. The team has been working with colleagues at Dana-Farber Cancer Institute to develop protocols to create the type of enriched B cell preparation that could be used to treat patients. “While more work is required to elucidate the cellular and molecular mechanisms through which B cells exert their beneficial function in wound healing, we are in the process of obtaining the required regulatory approvals to conduct a first clinical study in patients with diabetic foot ulcers. With adequate funding, we believe we could apply this technology clinically within one to two years” she says. The team is working in collaboration with study co-author Dennis Orgill, MD, PhD, of the Wound Care Center in the Plastic Surgery Division at Brigham and Women’s Hospital to set up a clinical study in patients with diabetic foot ulcers. Poznansky is an associate professor of Medicine at Harvard Medical School (HMS), and Sîrbulescu is an immunology researcher at MGH and a research fellow in Medicine at HMS. Additional co-authors of the Wound Repair and Regeneration paper are Chloe K. Boehm, Erin Soon, Ben Maxner, Nicolas Chronos, MD, Ann Sluder, PhD, MGH Vaccine and Immunotherapy Center; Moses Wilks, PhD, Hushan Yuan, PhD, Charalambos Kaittanis, PhD, Marc Normandin, PhD and Georges El Fakhri, PhD, MGH Department of Radiology; and Iulian Ilies¸ PhD, Northeastern University. Support for the study includes grants from the Trinity Innovation Fund of Holy Cross Hospital, Ft. Lauderdale, Florida; the VIC Innovation Fund, and National Institutes of Health grant 5R01 EB017699-03.